Good news for us Gleeks—Little, Brown Books for Young Readers has announced that they will release 5 original novels based on the TV show Glee. 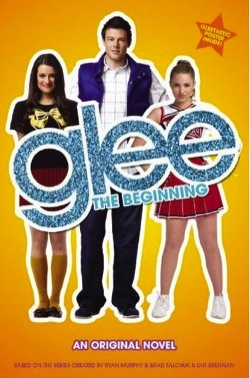 The first book, Glee: The Beginning , is a prequel and will be available at bookstores in August (you can pre-order it now on Amazon ). In case you haven’t seen it, Glee is a popular show on Fox about a high school glee club. It features extremely talented singers and dancers like Lea Michele, Matthew Morrison, and Jane Lynch. For a show whose success is directly linked to its musical performances, a series of novels seems like a surprising move. However, it might be fun to see what some of our favorite characters were like before they joined glee club. In the finale, Tina mentioned that before glee she only had two Facebook friends (her parents), so maybe the book will be about stuff like that. Or maybe it will go back to Mr. Schuester’s days in show choir and when he met future wife Terri. That could be a lot of fun! Are there any stories you would like to see in a Glee prequel? Do you worry that the show is becoming overexposed? Let me know in the comments.